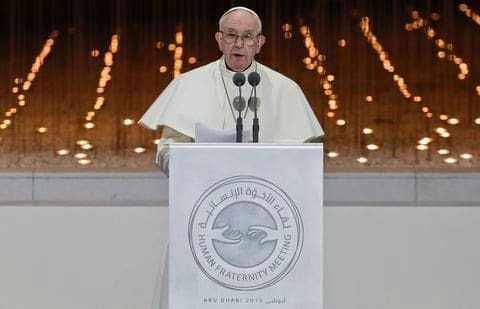 In his address to the interfaith meeting in Abu Dhabi, Francis said that religions must oppose violence and war. Education and justice are "the wings" of peace. Human fraternity and the right of citizenship, i.e. equality between citizens, can ensure religious freedom. Abu Dhabi (AsiaNews) – Pope Francis spoke at the Human Fraternity Meeting in Abud Dhabi, United Arab Emirates (UAE) in the presence of 700 religious leaders. In his address, the pontiff stressed the need for religions to promote peace, founded on human fraternity, and oppose violence and war. Based on the same principle of fraternity everyone should also exercise the right of equal citizenship. Touching issues like citizenship and equal rights are delicate since they are usually denied in the Islamic world, in accordance with references to the Qurʾān whereby non-Muslims are deemed "dhimmi", that is "protected", a status that gives them some rights, but not all, and requires them to pay the "jizya", a tribute to Muslim rulers. The same can be said about freedom of religion, which is limited, where it exists - like in the Emirates - to freedom of worship, that is to say the right to practise in "private". However, the Pope’s main issue was peace in a country engaged in the Yemeni conflict, which he raised during his meetings this afternoon. The first was a private tête-à-tête at 4.45 pm local (12.45 pm GMT) with the Muslim Council of Elders, at the Sheikh Zayed Grand Mosque. According to Alessandro Gisotti, acting Holy See Press Office director, the “Holy Father's meeting with the Muslim Council of Elders lasted about 30 minutes” and "took place in a particularly cordial and fraternal atmosphere, in which the importance of the culture of outreach was underlined to strengthen the commitment to dialogue and peace ". Francis, always accompanied by the Gran Imam of Al-Azhar, Ahmad Muhammad Al-Tayyib (pictured), the highest Sunni spiritual leader, and by the UAE ministers of Foreign Affairs, Tolerance and Culture, visited the Founder's Memorial for Interreligious Meeting. The Holy Father began his address from the belief that, like God who asked Noah to enter the ark with his family to preserve humanity from destruction, today “to safeguard peace, [we] need to enter together as one family into an ark which can sail the stormy seas of the world: the ark of fraternity. Peace needs two wings: education and justice. “Education also happens in a relationship, in reciprocity. Alongside the famous ancient maxim ‘know yourself’, we must uphold ‘know your brother or sister’: their history, their culture and their faith, because there is no genuine self-knowledge without the other. As human beings, and even more so as brothers and sisters, let us remind each other that nothing of what is human can remain foreign to us. It is important for the future to form open identities capable of overcoming the temptation to turn in on oneself and become rigid. “Here, in the desert, a way of fruitful development has been opened which, beginning from the creation of jobs, offers hope to many persons from a variety of nations, cultures and beliefs. Among them, many Christians too, whose presence in the region dates back centuries, have found opportunities and made a significant contribution to the growth and well-being of the country. In addition to professional skills, they bring you the genuineness of their faith. The respect and tolerance they encounter, as well as the necessary places of worship where they pray, allow them a spiritual maturity which then benefits society as a whole. I encourage you to continue on this path, so that those who either live here or are passing through may preserve not only the image of the great works erected in the desert, but also the image of a nation that includes and embraces all. “It is with this spirit that I look forward to concrete opportunities for meeting, not only here but in the entire beloved region, a focal point of the Middle East. I look forward to societies where people of different beliefs have the same right of citizenship and where only in the case of violence in any of its forms is that right removed. “A fraternal living together, founded on education and justice; a human development built upon a welcoming inclusion and on the rights of all: these are the seeds of peace which the world’s religions are called to help flourish. For them, perhaps as never before, in this delicate historical situation, it is a task that can no longer be postponed: to contribute actively to demilitarizing the human heart. The arms race, the extension of its zones of influence, the aggressive policies to the detriment of others will never bring stability. War cannot create anything but misery, weapons bring nothing but death!